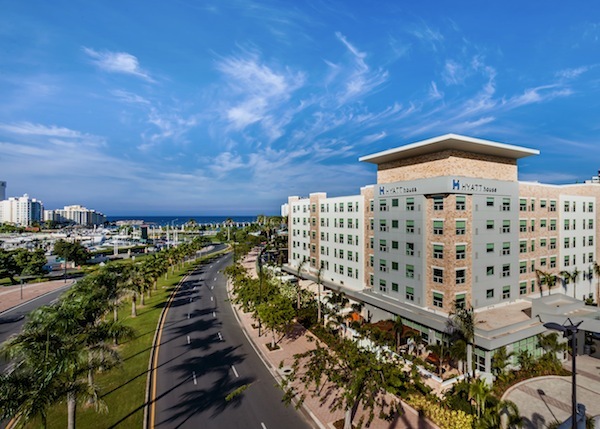 CHICAGO--(BUSINESS WIRE)-- Hyatt Hotels Corporation (NYSE: H) and PRISA Group and McConnell Valdés Consulting today announced the opening of Hyatt House San Juan , debuting as Puerto Rico’s first extended stay hotel as well as the brand’s first Hyatt House hotel outside of the continental United States. The Governor of Puerto Rico, the Hon. Alejandro Garcia Padilla , attended the hotel’s ribbon-cutting ceremony. Situated in the beautiful Miramar neighborhood, Hyatt House San Juan offers the conveniences of hotel living with the comforts of home. The 126-room hotel offers residentially inspired studio and one-bedroom suites, most with gorgeous views of the Atlantic Ocean and San Juan Bay. The hotel’s suites also feature contemporary full kitchens, living space with HDTVs and bedrooms with a plush bed. Hyatt House San Juan is conveniently located minutes away from the Puerto Rico Convention Center, Financial District in Hato Rey , Isla Grande Airport, and the Port of San Juan. The hotel is also just minutes from famous attractions, beautiful beaches, amazing golf courses, and landmarks, including Old San Juan, the Condado district, San Juan Central Park, and Plaza Las Américas. Hyatt House San Juan is under the leadership of General Manager Frankie Mariani and Director of Sales Laura Soto-Reyes . In his role, Mariani is directly responsible for managing the day-to-day operations of the hotel, including overseeing the hotel’s associates and ensuring guests encounter the purposeful service for which Hyatt House is known. Soto-Reyes is responsible for providing sales service and support to travelers and meeting planners frequenting the San Juan area. Hyatt House is bringing the neighborhood a little closer with a new program and offerings designed to help guests feel more like ‘residents’ so they feel part of the local neighborhood from the moment they arrive. New Neighborhood Guides at all 59 Hyatt House locations, including Hyatt House San Juan , offer experiences personally recommended by Martha Stewart Living Omnimedia, Inc. as part of the “Martha Stewart American Made” program, which celebrates local makers. The guides feature small businesses and the best places to Eat, Shop and Visit, from delicious pastries and homemade ice cream to neighborhood bookstores and vintage shops. Local makers selected for the Neighborhood Guides are just minutes away from Hyatt House hotels, allowing residents to explore the neighborhood with ease. PRISA Group is currently developing the Dorado Beach Resort, a $1.4 billion development, including the Dorado Beach, A Ritz Carlton Reserve, the first in the Americas, which opened to the public in December 2012, and the J.W. Marriott Dorado Beach, currently in development. In addition, the Company developed and owns two Hyatt Place & Casino projects in Bayamon and Manati, Puerto Rico, which opened in December 2013 and March 2014 respectively. Also, PRISA broke ground in March 2013 on Hyatt House San Juan , Puerto Rico’s first Extended Stay hotel, expected to open October 2014. For more information, please visit www.prisagroup.com.